Hymns and songs as theology. Hymns and songs as affirmation of faith. Hymns and songs as Scriptural teaching aid. Hymns and songs as worship. When we sing our faith, when we describe God's faithfulness or love or grace or provision, when we sing the Scriptures, we internalize it. We remember it. We write it on our hearts. It doesn't matter what style of music you sing. The important thing is the text. It has to say something, it has to mean something. It should teach us something about our faith and who God is. It must be theologically-grounded and scripturally accurate. "It has often been said (because it’s true) that Christians learn more of their working theology from the hymns they sing than from all their catechism or Sunday school classes or adult education groups." This even applies to some contemporary music - the author cites songs by Keith Getty such as "In Christ Alone" and "See, What a Morning." These worship songs have accessible, singable melodies (hymn-like, even) that "join strong theological language with personal faith." The authors explore the role of hymns and hymn-singing in faith formation and spiritual growth. They ask: "Are hymns merely the expression of a community’s faith or are they integral in forming the faith of that community?" This index features 100 contemporary worship songs rated on theology, language, and singability. McElwain offers a historical perspective on hymn-singing and the role of teaching theology. "Just as Charles Wesley's hymns taught theology to a largely uneducated population, hymns can teach theology in today's church,” he wrote (p. 2). McElwain suggests, "The best of hymnody includes both genuine doxology and sound theology" (p. 3) - what a beautiful perspective. Finally, the author warns against singing old hymns just because they're favorites; sometimes, the text is void of meaning and may even be theologically inaccurate. "Truth can, and should, be sung," McElwain wrote. "As truth is sung, it will be retained more effectively by worshipers" (p. 10). Psalm 23 - "The King of Love My Shepherd Is" Psalm 24 - "Lift Up Your Heads, Ye Mighty Gates" Psalm 27:1-3 - "God Is My Strong Salvation" Psalm 35:28 - "O For a Thousand Tongues to Sing" Psalm 46 - "A Mighty Fortress Is Our God" Psalm 90:1-5 - "O God, Our Help in Ages Past" Psalm 100 - "All People That on Earth Do Dwell" Psalm 103 - "Praise, My Soul, the King of Heaven" Psalm 105:39-41 - "Glorious Things of Thee Are Spoken" Psalm 107:1-31 - "Now Thank We All Our God" Psalm 148 - "All Creatures of Our God and King" Psalm 150 - "Praise to the Lord, the Almighty"
"The hymnal calls for us to be participators, to be actively involved in worship." Eskew recommends using the topical index in the back of the hymnal to find hymns that teach theology. Look for topics like: Creation, The Holy Trinity, The Incarnation, and Salvation. You can also do this on hymnary.org. Search for contemporary worship songs by theme/topic, keyword, or Scripture reference or find a list of songs correlated with the lectionary (this site includes five different lectionaries, including the Narrative Lectionary). Each song listing includes full text; author, copyright, and licensing information; tags and Scripture references; and links to the song/lyrics on CCLI, Worship Together, Praise Charts, Song Select, YouTube, MusicNotes, Spotify, and Genius. Payne offers a thorough review of the theology in five popular Christmas carols and hymns. Wouldn't this be a great basis for a short class or series on hymns and theology? Maybe for the December issue of your church newsletter? "Understanding and applying musical theology deepens worshipers' experience of God and better prepares them to share God's Word in the world," Huyser-Honig wrote. 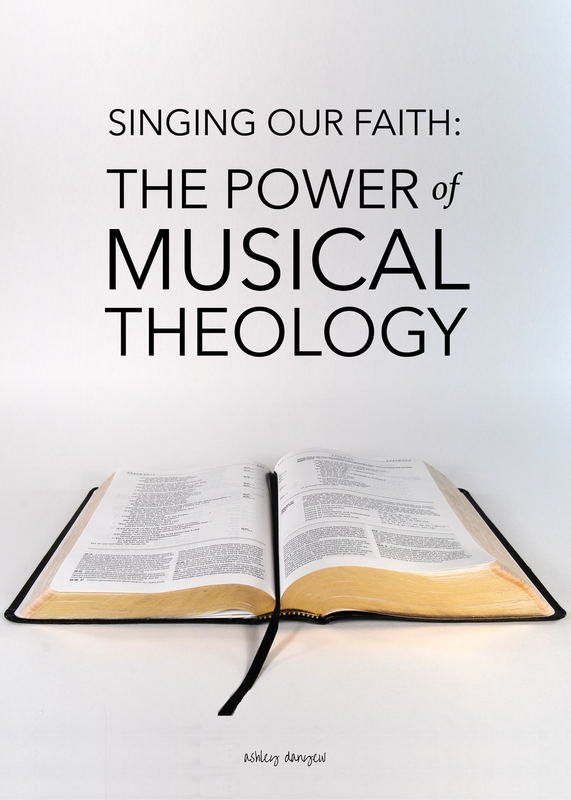 The author traces the significance of musical theology from Bach to present day, sharing the perspectives of scholars, pastors, and church musicians throughout the article. LuAnn Steiner, a music assistant and children's choir director at a Mennonite church described the importance of having a cohesive theme and key theological point for each service: "When Scripture, visuals, music, and movement all work toward the service theme, there's a greater chance for worship that praises the Creator and nourishes and sustains the people." This article outlines the importance of music in worship and offers a few reflections on the role of theology. Simply put, "Songs of worship shape faith." What theology is expressed in our congregational singing? Is there sufficient breadth (pastoral, liturgical, historical/cultural, generational) in our music? What do we learn about God and the Christian faith from what we sing? Does the music we sing encourage spiritual growth and discipleship? What are your thoughts on musical theology? What criteria do you use for choosing music for worship?